As colder weather starts to settle into the Las Vegas area for the winter season, you probably aren’t thinking about your vehicle’s air conditioning. We would like to encourage you to reconsider this approach because the best time to make sure your air conditioning is at factory specifications is at the end of the summer. That’s because the summer was a real scorcher this year in Las Vegas and your air conditioning system worked extra hard doing its job. A Nissan Air Conditioning Performance Check is one of the best ways to ensure that your air conditioning system is operating at peak performance and ready to take on the next hot season that really isn’t that far away. At United Nissan, we always recommend being proactive with service to help prevent more expensive repairs. If you are experiencing any of the signs that you need a Nissan Air Conditioning Performance Check, then United Nissan has the perfect solution for you. Schedule service today and we’ll assign one of our expert certified technicians to the task. Nissan engineers a durable air conditioning system that is installed on all vehicles. But the air conditioning system does a tough job and its components will start to get dirty and wear out over time. The complexity of the system makes it difficult to take care of on your own. Don’t fret because United Nissan has a team of expert technicians, equipment, and a proven service protocol that gets the job done right. At the end of every Nissan Air Conditioning Performance Check, you’ll know that your air conditioning system is at peak performance and is ready to give you the coldest air possible on sweltering days. United Nissan is conveniently located in Las Vegas within driving distance of Paradise and Spring Valley. If you own a Nissan and live in Las Vegas, Paradise, or the Spring Valley region, then get peace of mind with your next Nissan Air Conditioning Performance Check at United Nissan. 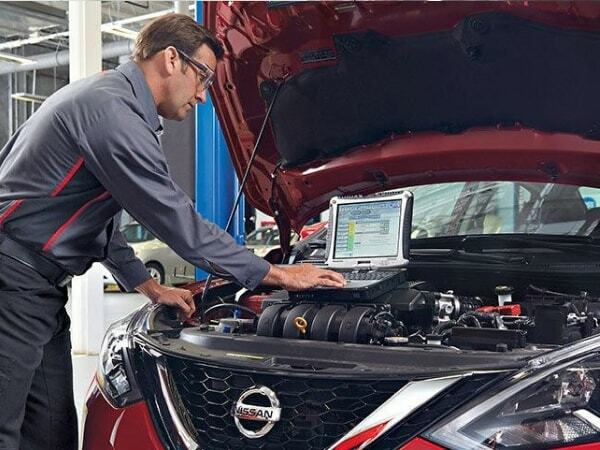 Every Nissan Air Conditioning Performance Check is completed by an expert certified technician that knows your vehicle inside and out.